Title The / Holy Bible, / Translated from the / Latin Vulgate: / Diligently Compared with the Hebrew, Greek, and Other / Editions, in Divers Languages; / The / Old Testament, / First Published by the / English College, at Douay, A.D. 1609; / and the / New Testament, / First Published by the / English College, at Rheims, A.D. 1582. / with / Annotations, References, / and / an Historical and Chronological Index. / From the Last London and Dublin Editions. 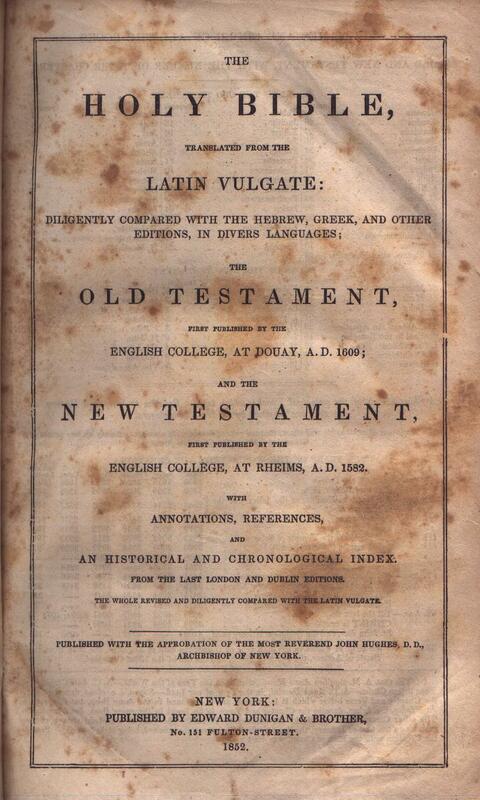 / the Whole Revised and Diligently Compared with the Latin Vulgate. / Published with the Approbation of the Right Rev. John Dubois, Catholic Bishop of N.Y. / New York: / Published by John Doyle, No. 294, Pearl-Street. / Stereotyped by Conner & Cooke. /1836. Title The / Holy Bible, / Translated from the / Latin Vulgate: / Diligently Compared with the Hebrew, Greek, and Other / Editions, in Divers Languages; / The / Old Testament, / First Published by the / English College, at Douay, A.D. 1609; / and the / New Testament, / First Published by the / English College, at Rheims, A.D. 1582. / with / Annotations, References, / and / an Historical and Chronological Index. / From the Last London and Dublin Editions. 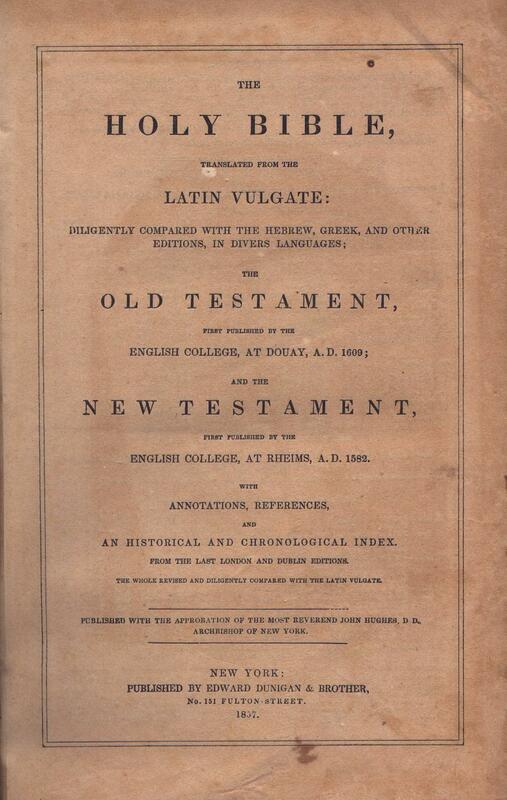 / the Whole Revised and Diligently Compared with the Latin Vulgate. / Published with the Approbation of the Right Rev. John Dubois, Catholic Bishop of N.Y. / New York: / Published by John Doyle, No. 169, Broadway. / Stereotyped by Conner & Cooke. /1840. Title The / Holy Bible, / Translated from the / Latin Vulgate: / Diligently Compared with the Hebrew, Greek, and Other / Editions, in Divers Languages; / The / Old Testament, / First Published by the / English College, at Douay, A.D. 1609; / and the / New Testament, / First Published by the / English College, at Rheims, A.D. 1582. / with / Annotations, References, / and / an Historical and Chronological Index. / From the Last London and Dublin Editions. 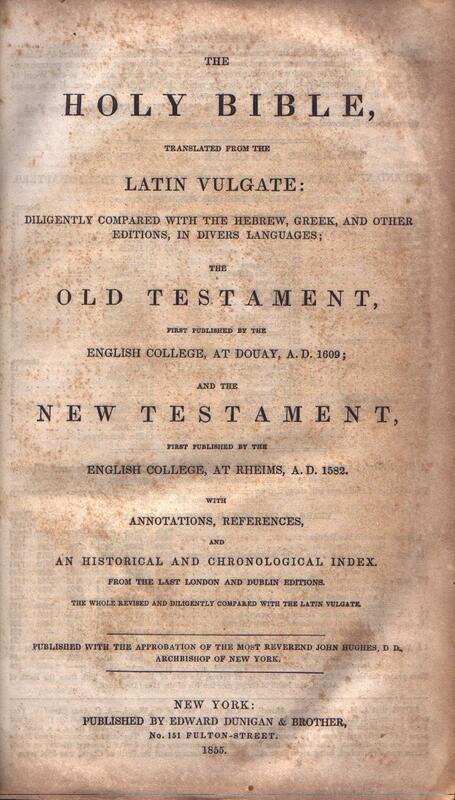 / the Whole Revised and Diligently Compared with the Latin Vulgate. / Published with the Approbation of the Right Rev. John Dubois, Catholic Bishop of N.Y. / New York: / Published by John Doyle, No. 169, Broadway. / Stereotyped by Conner & Cooke /1843. Comments This is the final Doyle edition before publication was taken over by Dunigan (see next edition). Title The / Holy Bible, / Translated from the / Latin Vulgate: / Diligently Compared with the Hebrew, Greek, and Other / Editions, in Divers Languages; / The / Old Testament, / First Published by the / English College, at Douay, A.D. 1609; / and the / New Testament, / First Published by the / English College, at Rheims, A.D. 1582. / with / Annotations, References, / and / an Historical and Chronological Index. / From the Last London and Dublin Editions. 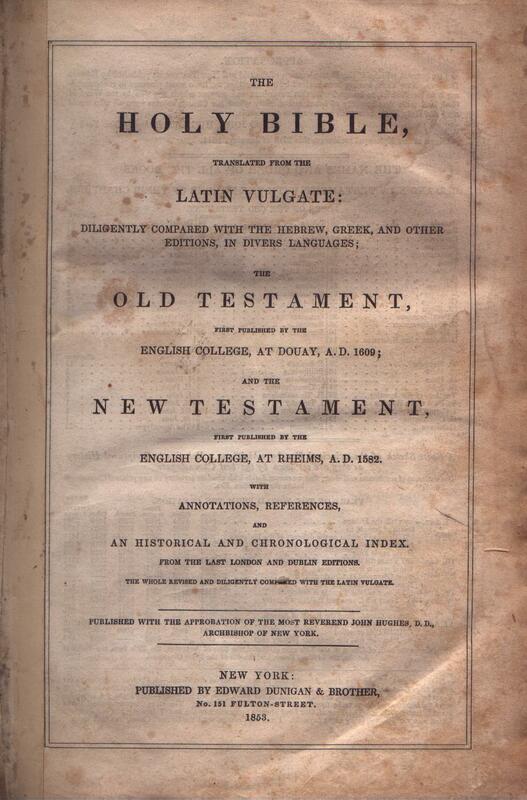 / the Whole Revised and Diligently Compared with the Latin Vulgate. / Published with the Approbation of the Right Reverend John Hughes, D.D., / Bishop of New York. / New York: / Published by Edward Dunigan, 151 Fulton Street. / 1844. Comments This is the first edition by Dunigan who would continue publication for many more years. Title The / Holy Bible, / Translated from the / Latin Vulgate: / Diligently Compared with the Hebrew, Greek, and Other / Editions, in Divers Languages; / The / Old Testament, / First Published by the / English College, at Douay, A.D. 1609; / and the / New Testament, / First Published by the / English College, at Rheims, A.D. 1582. / with / Annotations, References, / and / an Historical and Chronological Index. / From the Last London and Dublin Editions. 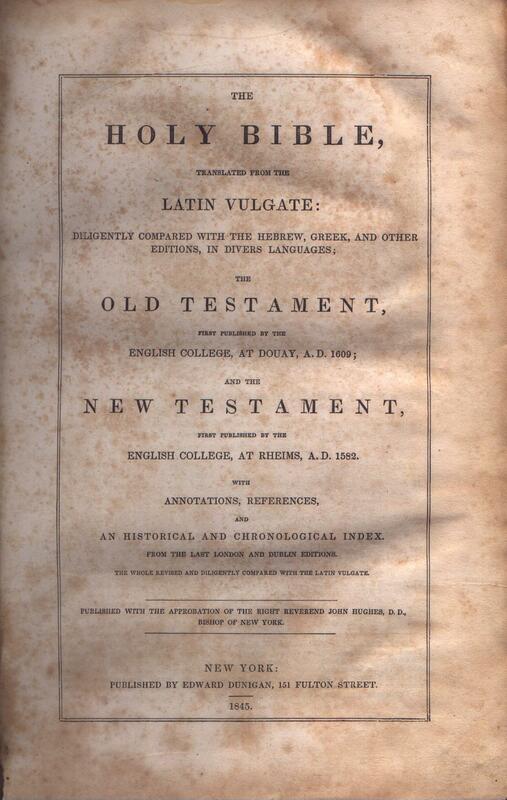 / the Whole Revised and Diligently Compared with the Latin Vulgate. / Published with the Approbation of the Right Reverend John Hughes, D.D., / Bishop of New York. / New York: / Published by Edward Dunigan, 151 Fulton Street. / 1845. Recent Sale A copy of this edition sold for $275 on Ebay (Item No. 111134708740) on Aug. 7, 2013. 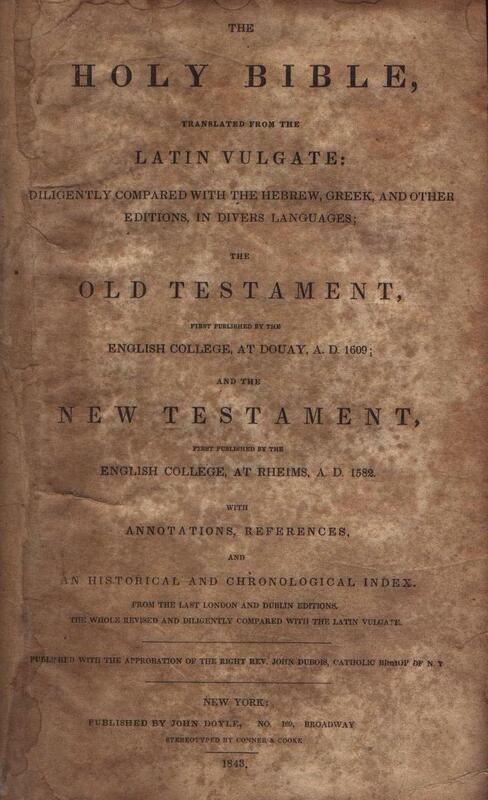 Title The / Holy Bible, / Translated from / The Latin Vulgate: / Diligently Compared with the Hebrew, Greek, and Other / Editions, in Divers Languages; / The / Old Testament, / First Published by the / English College, at Douay, A.D. 1609; / and / The New Testament, / First Published by the / English College, at Rheims, A.D. 1582. / with / Annotations, References, / and / an Historical and Chronological Index. / From the Last London and Dublin Editions. 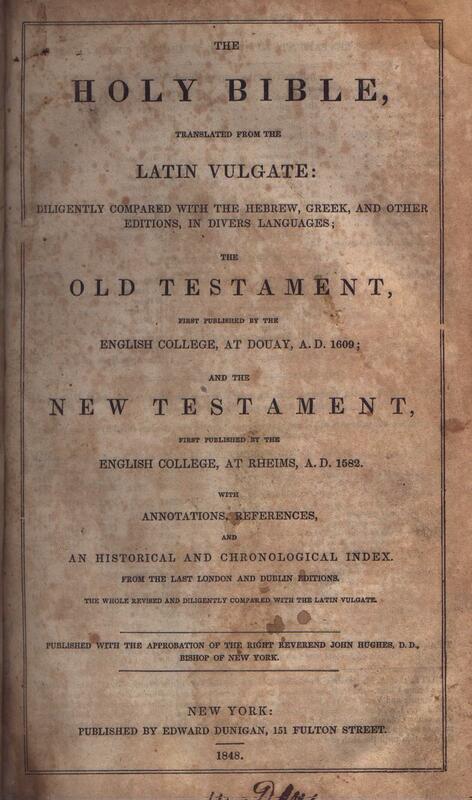 / The Whole Revised and Diligently Compared with the Latin Vulgate. / Published with the Approbation of the Right Reverend John Hughes, D.D., / Bishop of New York. / London: Thomas Richardson and Son, 172, Fleet Street; 16, Dawson Street, Dublin; and Derby. Comment A unique edition for export to England. 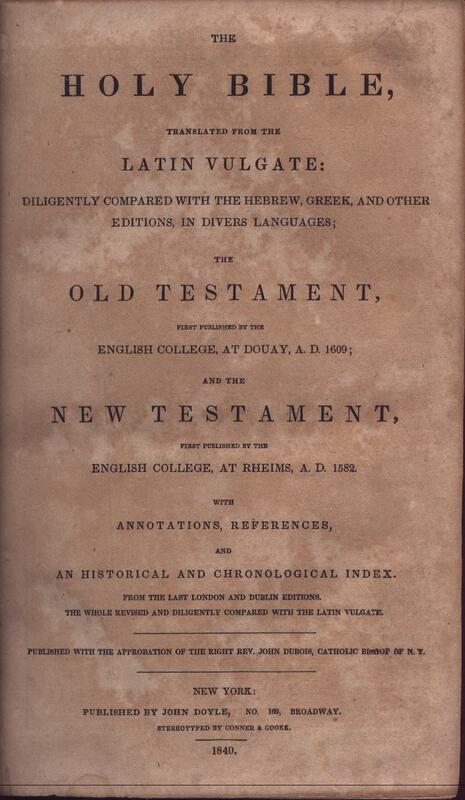 Title The / Holy Bible, / Translated from the / Latin Vulgate: / Diligently Compared with the Hebrew, Greek, and Other / Editions, in Divers Languages; / The / Old Testament, / First Published by the / English College, at Douay, A.D. 1609; / and the / New Testament, / First Published by the / English College, at Rheims, A.D. 1582. / with / Annotations, References, / and / an Historical and Chronological Index. / From the Last London and Dublin Editions. 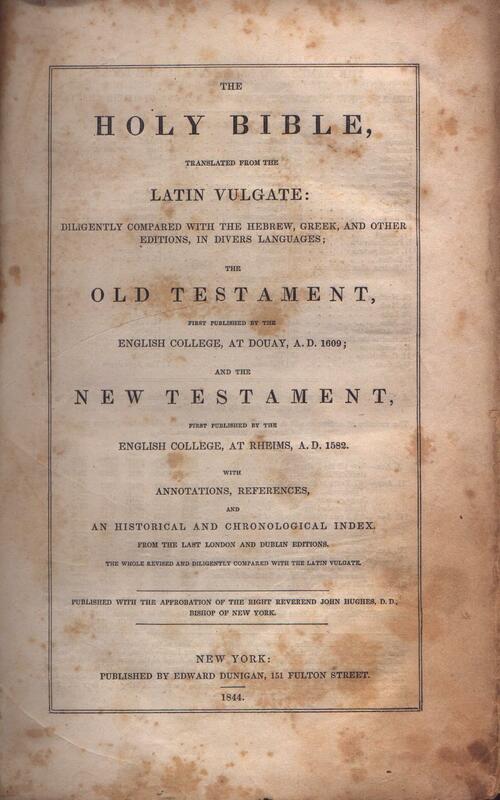 / the Whole Revised and Diligently Compared with the Latin Vulgate. / Published with the Approbation of the Right Reverend John Hughes, D.D., / Bishop of New York. / New York: / Published by Edward Dunigan, 151 Fulton Street. / 1846. Title The / Holy Bible, / Translated from the / Latin Vulgate: / Diligently Compared with the Hebrew, Greek, and Other / Editions, in Divers Languages; / The / Old Testament, / First Published by the / English College, at Douay, A.D. 1609; / and the / New Testament, / First Published by the / English College, at Rheims, A.D. 1582. / with / Annotations, References, / and / an Historical and Chronological Index. / From the Last London and Dublin Editions. 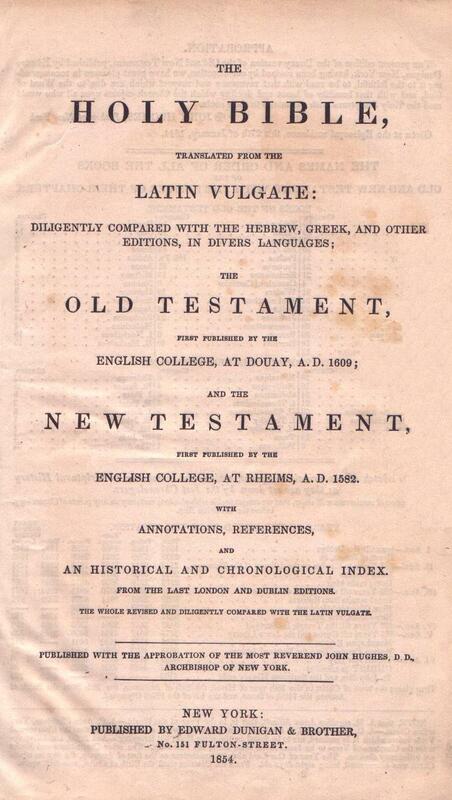 / the Whole Revised and Diligently Compared with the Latin Vulgate. / Published with the Approbation of the Right Reverend John Hughes, D.D., / Bishop of New York. / New York: / Published by Edward Dunigan, 151 Fulton Street. / 1848. 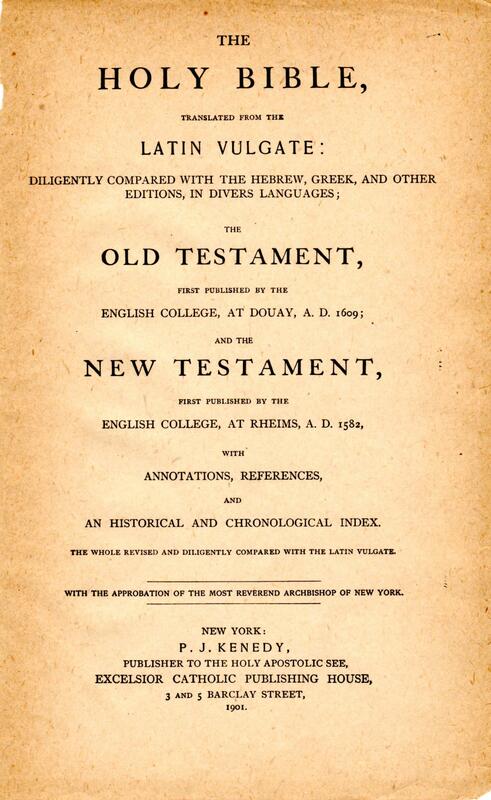 Title The / Holy Bible, / Translated from the / Latin Vulgate: / Diligently Compared with the Hebrew, Greek, and Other / Editions, in Divers Languages; / The / Old Testament, / First Published by the / English College, at Douay, A.D. 1609; / and the / New Testament, / First Published by the / English College, at Rheims, A.D. 1582. / with / Annotations, References, / and / an Historical and Chronological Index. / From the Last London and Dublin Editions. 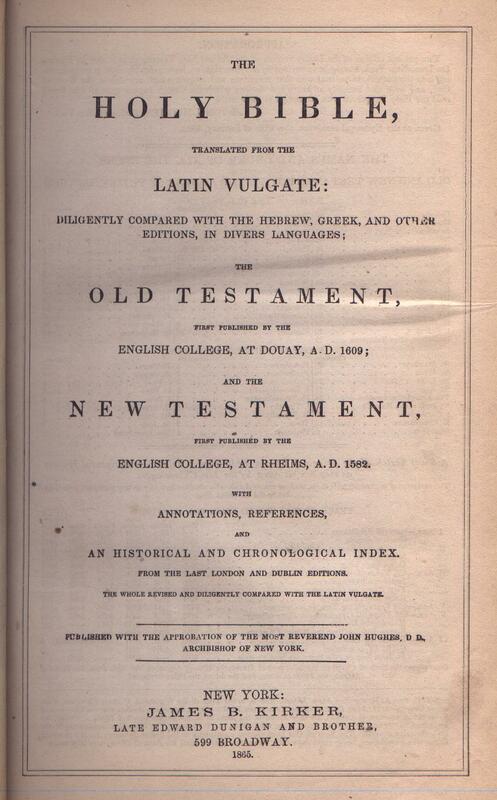 / the Whole Revised and Diligently Compared with the Latin Vulgate. / Published with the Approbation of the Right Reverend John Hughes, D.D., / Bishop of New York. / New York: / Published by Edward Dunigan & Brother, / 151 Fulton-Street. / 1848. Comments The addition of the name "& Brother" refers to Dunigan's half-brother, James B. Kirker. Title The / Holy Bible, / Translated from the / Latin Vulgate: / Diligently Compared with the Hebrew, Greek, and Other / Editions, in Divers Languages; / The / Old Testament, / First Published by the / English College, at Douay, A.D. 1609; / and the / New Testament, / First Published by the / English College, at Rheims, A.D. 1582. / with / Annotations, References, / and / an Historical and Chronological Index. / From the Last London and Dublin Editions. 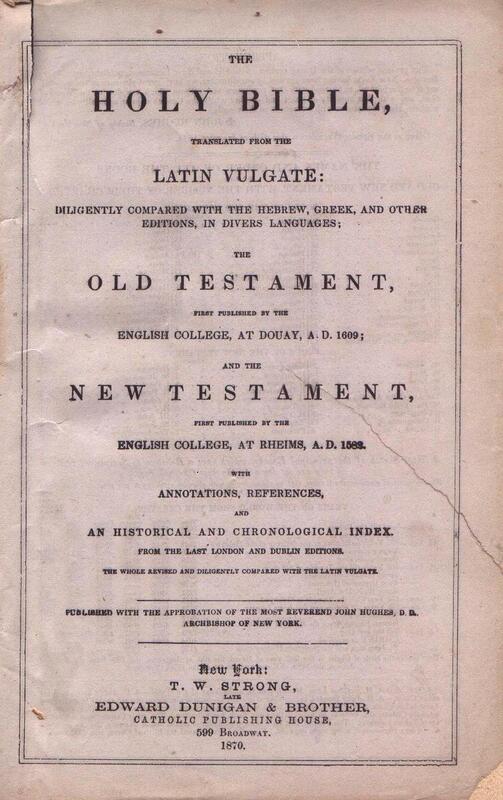 / the Whole Revised and Diligently Compared with the Latin Vulgate. / Published with the Approbation of the Right Reverend John Hughes, D.D., / Bishop of New York. / New York: / Published by Edward Dunigan & Brother, / 151 Fulton-Street. / 1850. Comments This is the last edition to show Hughes with the title "Bishop." He was elevated to Archbishop during 1850, the latter title appearing in subsequent editions. Title The / Holy Bible, / Translated from the / Latin Vulgate: / Diligently Compared with the Hebrew, Greek, and Other / Editions, in Divers Languages; / The / Old Testament, / First Published by the / English College, at Douay, A.D. 1609; / and the / New Testament, / First Published by the / English College, at Rheims, A.D. 1582. / with / Annotations, References, / and / an Historical and Chronological Index. / From the Last London and Dublin Editions. 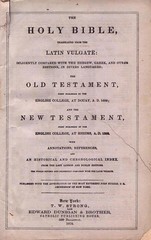 / the Whole Revised and Diligently Compared with the Latin Vulgate. / Published with the Approbation of the Right Reverend John Hughes, D.D., / Archbishop of New York. / New York: / Published by Edward Dunigan & Brother, / 151 Fulton-Street. / 1851. Comments John Hughes was elevated to Archbishop in 1850, causing his title to change in this and subsequent editions. Title The / Holy Bible, / Translated from the / Latin Vulgate: / Diligently Compared with the Hebrew, Greek, and Other / Editions, in Divers Languages; / The / Old Testament, / First Published by the / English College, at Douay, A.D. 1609; / and the / New Testament, / First Published by the / English College, at Rheims, A.D. 1582. / with / Annotations, References, / and / an Historical and Chronological Index. / From the Last London and Dublin Editions. 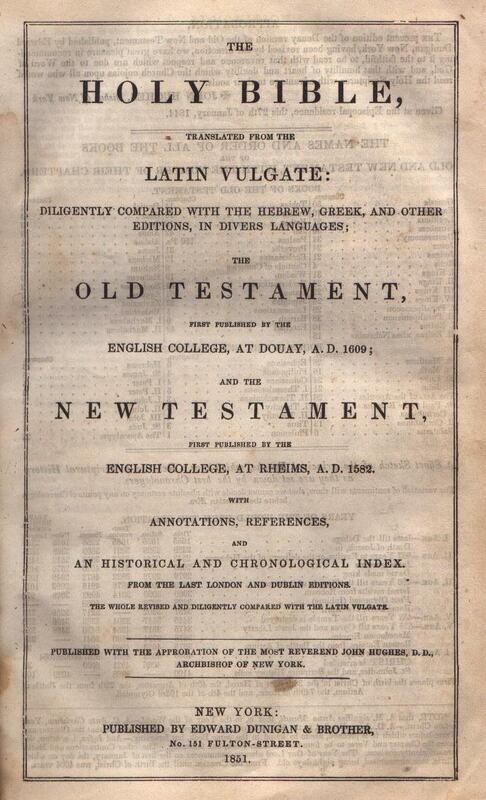 / the Whole Revised and Diligently Compared with the Latin Vulgate. / Published with the Approbation of the Right Reverend John Hughes, D.D., / Archbishop of New York. / New York: / Published by Edward Dunigan & Brother, / 151 Fulton-Street. / 1852. 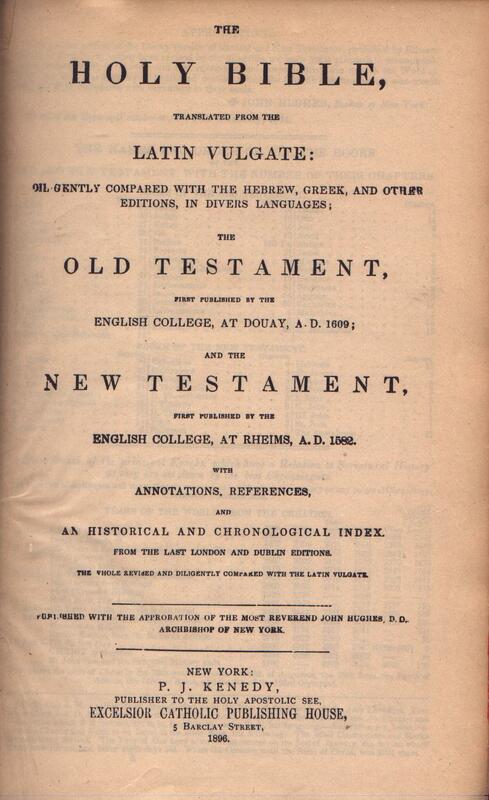 Title The / Holy Bible, / Translated from the / Latin Vulgate: / Diligently Compared with the Hebrew, Greek, and Other / Editions, in Divers Languages; / The / Old Testament, / First Published by the / English College, at Douay, A.D. 1609; / and the / New Testament, / First Published by the / English College, at Rheims, A.D. 1582. / with / Annotations, References, / and / an Historical and Chronological Index. / From the Last London and Dublin Editions. 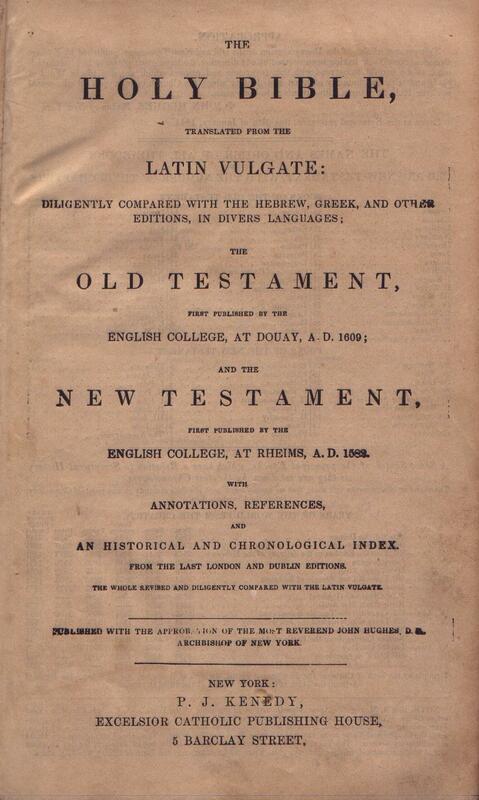 / the Whole Revised and Diligently Compared with the Latin Vulgate. / Published with the Approbation of the Right Reverend John Hughes, D.D., / Archbishop of New York. / New York: / Published by Edward Dunigan & Brother, / 151 Fulton-Street. / 1853. Comments Dunigan died in 1853, leaving the business to his half brother James B. Kirker. However, Kirker's name does not appear as publisher until the 1858 edition. Title The / Holy Bible, / Translated from the / Latin Vulgate: / Diligently Compared with the Hebrew, Greek, and Other / Editions, in Divers Languages; / The / Old Testament, / First Published by the / English College, at Douay, A.D. 1609; / and the / New Testament, / First Published by the / English College, at Rheims, A.D. 1582. / with / Annotations, References, / and / an Historical and Chronological Index. / From the Last London and Dublin Editions. 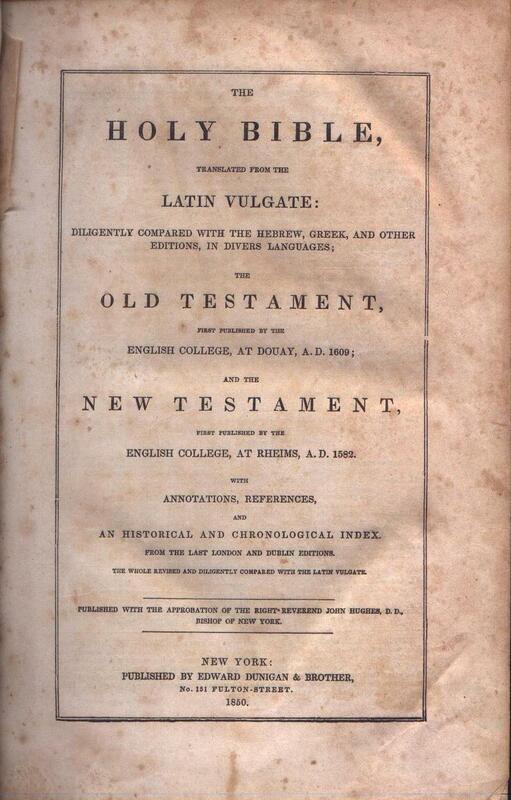 / the Whole Revised and Diligently Compared with the Latin Vulgate. / Published with the Approbation of the Right Reverend John Hughes, D.D., / Archbishop of New York. / New York: / Published by Edward Dunigan & Brother, / No. 151 Fulton-Street. / 1854. Title The / Holy Bible, / Translated from the / Latin Vulgate: / Diligently Compared with the Hebrew, Greek, and Other / Editions, in Divers Languages; / The / Old Testament, / First Published by the / English College, at Douay, A.D. 1609; / and the / New Testament, / First Published by the / English College, at Rheims, A.D. 1582. / with / Annotations, References, / and / an Historical and Chronological Index. / From the Last London and Dublin Editions. / the Whole Revised and Diligently Compared with the Latin Vulgate. / Published with the Approbation of the Right Reverend John Hughes, D.D., / Archbishop of New York. / New York: / Published by Edward Dunigan & Brother, / 151 Fulton-Street. / 1855. Title The / Holy Bible, / Translated from the / Latin Vulgate: / Diligently Compared with the Hebrew, Greek, and Other / Editions, in Divers Languages; / The / Old Testament, / First Published by the / English College, at Douay, A.D. 1609; / and the / New Testament, / First Published by the / English College, at Rheims, A.D. 1582. / with / Annotations, References, / and / an Historical and Chronological Index. / From the Last London and Dublin Editions. 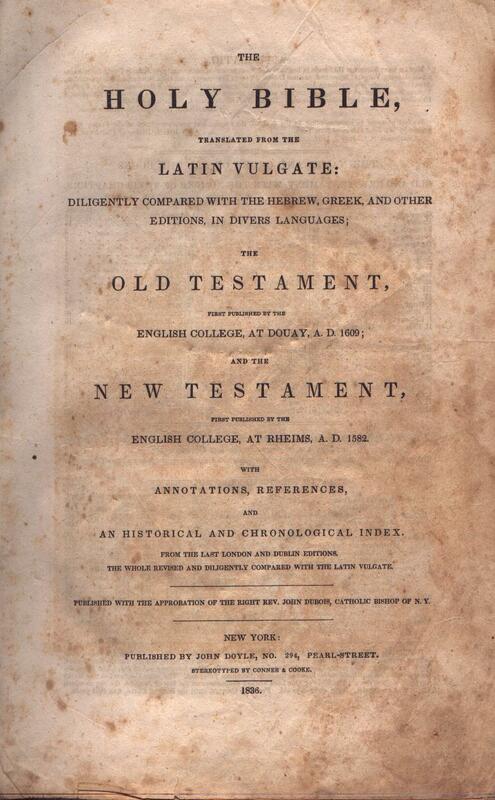 / the Whole Revised and Diligently Compared with the Latin Vulgate. / Published with the Approbation of the Right Reverend John Hughes, D.D., / Archbishop of New York. / New York: / Published by Edward Dunigan & Brother, / 151 Fulton-Street. / 1857. Title The / Holy Bible, / Translated from the / Latin Vulgate: / Diligently Compared with the Hebrew, Greek, and Other / Editions, in Divers Languages; / The / Old Testament, / First Published by the / English College, at Douay, A.D. 1609; / and the / New Testament, / First Published by the / English College, at Rheims, A.D. 1582. / with / Annotations, References, / and / an Historical and Chronological Index. / From the Last London and Dublin Editions. 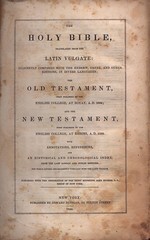 / the Whole Revised and Diligently Compared with the Latin Vulgate. / Published with the Approbation of the Right Reverend John Hughes, D.D., / Archbishop of New York. / New York: / Edward Dunigan and Brother, / (James B. Kirker,) / 371 Broadway. / 1858. Comments Dunigan's half-brother, James B. Kirker, took over the company after Dunigan's death. Title The / Holy Bible, / Translated from the / Latin Vulgate: / Diligently Compared with the Hebrew, Greek, and Other / Editions, in Divers Languages; / The / Old Testament, / First Published by the / English College, at Douay, A.D. 1609; / and the / New Testament, / First Published by the / English College, at Rheims, A.D. 1582. / with / Annotations, References, / and / an Historical and Chronological Index. / From the Last London and Dublin Editions. 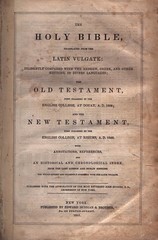 / the Whole Revised and Diligently Compared with the Latin Vulgate. / Published with the Approbation of the Right Reverend John Hughes, D.D., / Archbishop of New York. / New York: / James B. Kirker, / Late Edward Dunigan and Brother, / 599 Broadway. / 1865. Title The / Holy Bible, / Translated from the / Latin Vulgate: / Diligently Compared with the Hebrew, Greek, and Other / Editions, in Divers Languages; / The / Old Testament, / First Published by the / English College, at Douay, A.D. 1609; / and the / New Testament, / First Published by the / English College, at Rheims, A.D. 1582. / with / Annotations, References, / and / an Historical and Chronological Index. / From the Last London and Dublin Editions. 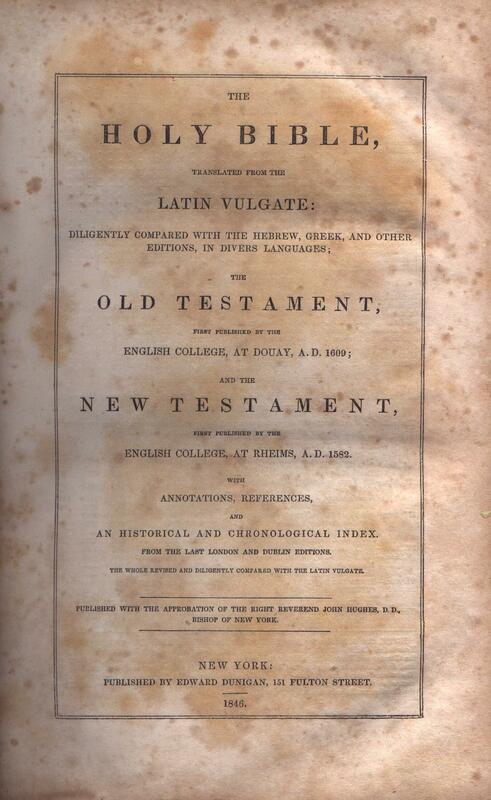 / the Whole Revised and Diligently Compared with the Latin Vulgate. / Published with the Approbation of the Right Reverend John Hughes, D.D., / Archishop of New York. / New York: / T. W. Strong, / Late / Edward Dunigan & Brother, / Catholic Publishing House, / 599 Broadway. / 1870. Comments James B. Kirker (publisher of the 1865 edition above) died in 1868. The business was taken over by T. W. Strong, who operated it until ca. 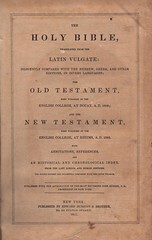 1877,when he sold out to P. J. Kenedy (publisher of the following edition, below). Title The / Holy Bible, / Translated from the / Latin Vulgate: / Diligently Compared with the Hebrew, Greek, and Other / Editions, in Divers Languages; / The / Old Testament, / First Published by the / English College, at Douay, A.D. 1609; / and the / New Testament, / First Published by the / English College, at Rheims, A.D. 1582. / with / Annotations, References, / and / an Historical and Chronological Index. / From the Last London and Dublin Editions. / the Whole Revised and Diligently Compared with the Latin Vulgate. / Published with the Approbation of the Right Reverend John Hughes, D.D., / Archishop of New York. / New York: / P. J. Kenedy, / Excesior Catholic Publishing House, / 5 Barclay Street. 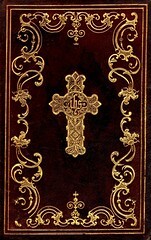 Comments Long time Catholic publisher Kenedy purchased the plates of this edition circa 1877 and began publication. Title The / Holy Bible, / Translated from the / Latin Vulgate: / Diligently Compared with the Hebrew, Greek, and Other / Editions, in Divers Languages; / The / Old Testament, / First Published by the / English College, at Douay, A.D. 1609; / and the / New Testament, / First Published by the / English College, at Rheims, A.D. 1582. / with / Annotations, References, / and / an Historical and Chronological Index. / From the Last London and Dublin Editions. 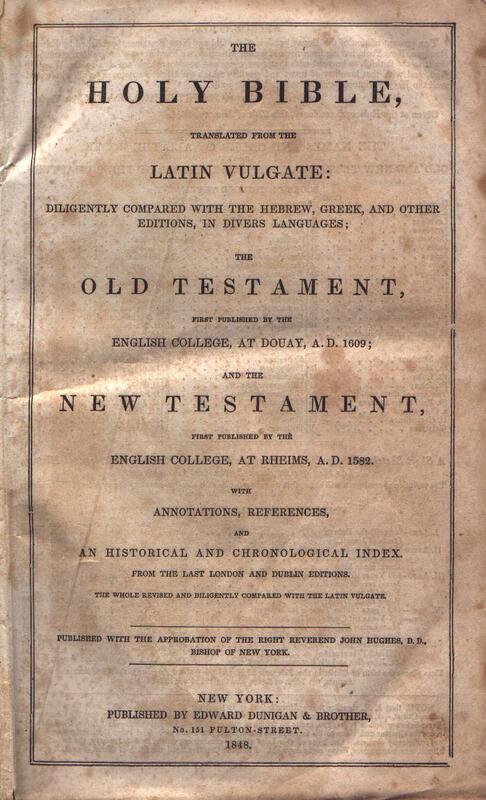 / the Whole Revised and Diligently Compared with the Latin Vulgate. / Published with the Approbation of the Right Reverend John Hughes, D.D., / Archbishop of New York. / New York: / P. J. Kenedy, / Publisher to the Holy Apostolic See, / Excelsior Catholic Publishing House, / 5 Barclay Street / 1896. 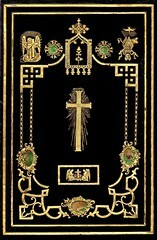 Comments By the time this edition was published, Kenedy had been awarded by the Vatican the right to use the title Official Publisher to the Holy Apostolic See. 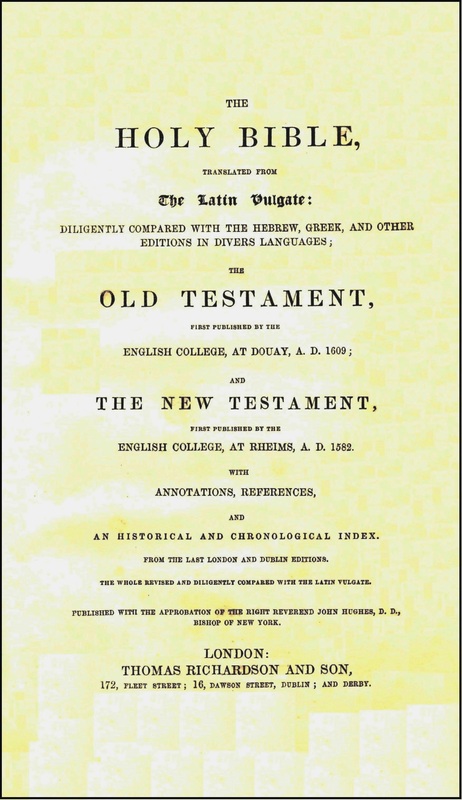 Title The / Holy Bible, / Translated from the / Latin Vulgate: / Diligently Compared with the Hebrew, Greek, and Other / Editions, in Divers Languages; / The / Old Testament, / First Published by the / English College, at Douay, A.D. 1609; / and the / New Testament, / First Published by the / English College, at Rheims, A.D. 1582, / with / Annotations, References, / and / an Historical and Chronological Index. 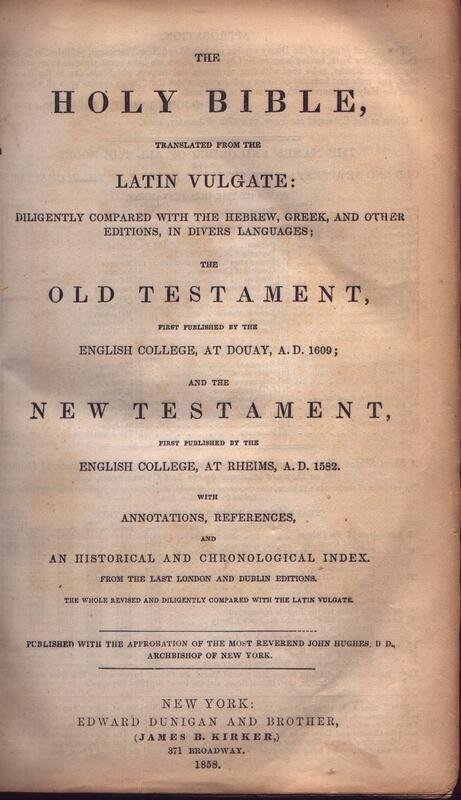 / the Whole Revised and Diligently Compared with the Latin Vulgate. / Published with the Approbation of the Most Reverend Archbishop of New York. / New York: / P. J. Kenedy, / Publisher to the Holy Apostolic See, / Excelsior Catholic Publishing House, / 3 & 5 Barclay Street, / 1901. Comments This long-running edition, first published by John Doyle in 1833, continued until the next century.